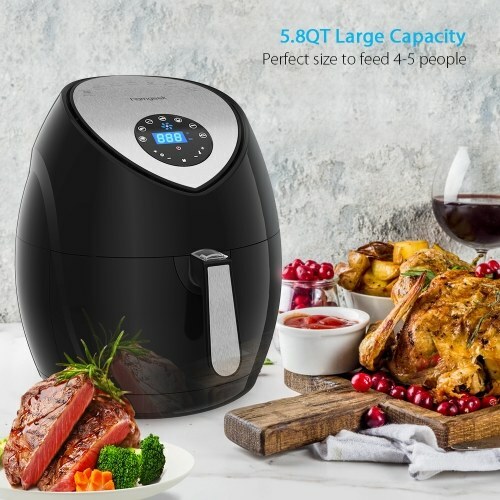 Using little or no oil, this innovative Homgeek Air Fryer adopts modern technology to baking, roasting and grilling your favorite foods from crispy potato, French fries, onion rings to BBQ satay, steaks, Pizzas, and cakes. This air fryer features easily touch control, non-slip feet, slide-out frying basket & pan, digital LED panel with touch control, 5.5L frying basket capacity, safety auto power off, auto timer setting up to 60 min., adjustable temperature from 180℉ to 400℉, rapid air circulation for even cooking, double overheat protection, etc. 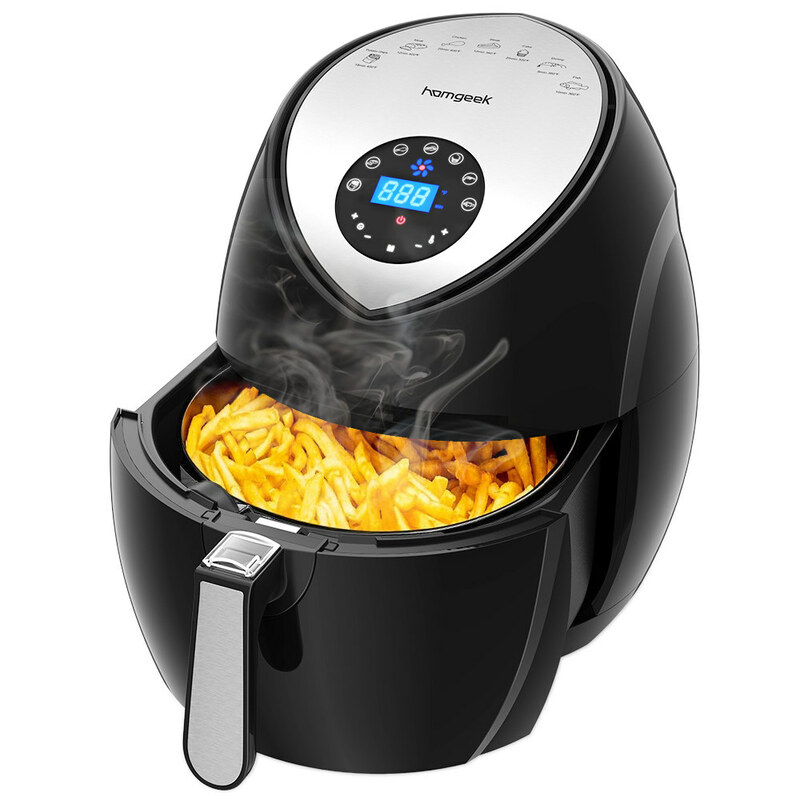 Really a stylish and functional air fryer to make a delicious meal by yourself, surely you cannot miss this! 5.8 QT Capacity: 5.5L/5.8QT large food basket, allows you to fry more food at a time for 5-8 persons. Cooking Timer up to 60 Minutes: the air fryer will shut off automatically at the present time. Temperature Control: easily touch control to adjust the temperature from 180℉ to 400℉. Double Over-heat Protection: when the temperature reaches the setpoint or the pan is pulled out, the appliance will stop heating. Easy to Clean: removable fryer basket and pan are dishwasher safe, cleanup is a breeze. Reliable Quality: galvanized steel sheet inner supporting base plate and PPS air outlet, both are more resistant to high temperatures, not easily deformed, easy for cleaning and maintenance. Silicone Supporting Point Between Fryer Basket and Pan: protect the nonstick coating from shed off. Long Service Life: a heating tube with bluing treatment, more resisting to corrosion and rubbing, which make it much more durable. Digital Control Panel: clear LED display, easy to select the cooking time and temperature with the touch panel. 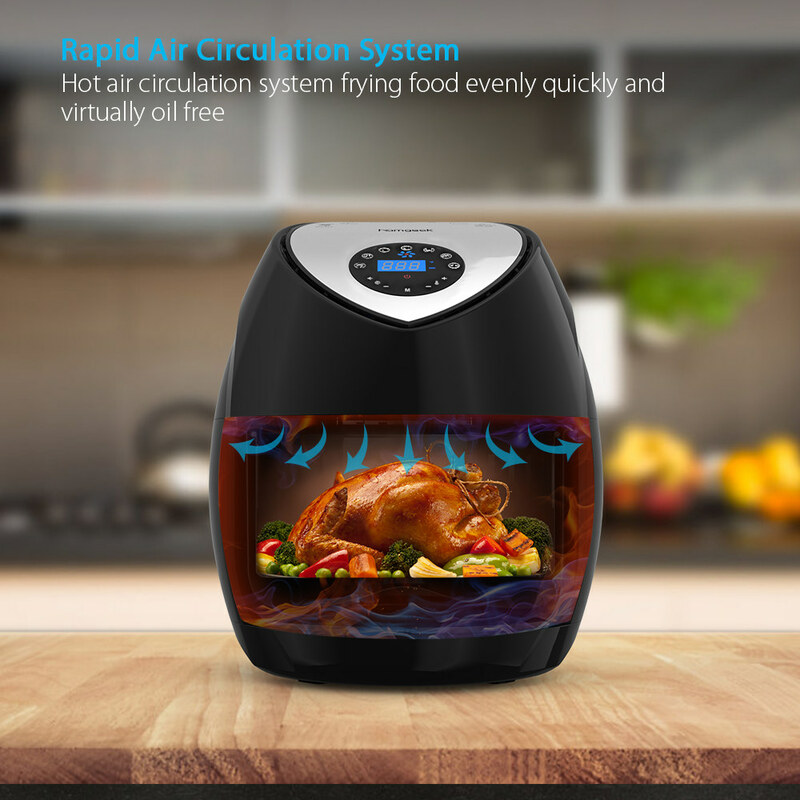 Built-in Rotor Air Circulate System: heating up ingredients quickly, evenly and thoroughly, yet save energy. Durable Nonstick Protective Coating: wear-resisting and withstand high temperatures, not easily shed off and for easy cleanup. 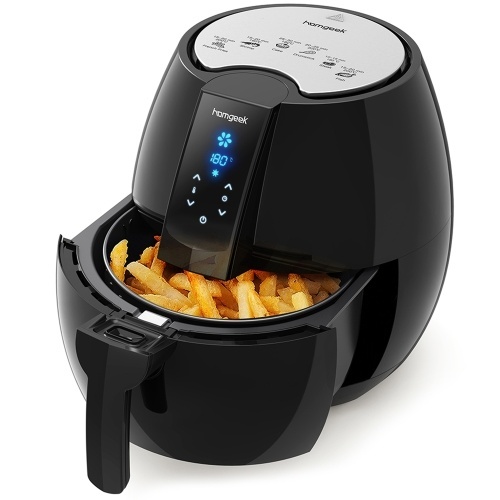 Non-slip Bottom: air fryer stands stable on the desktop. 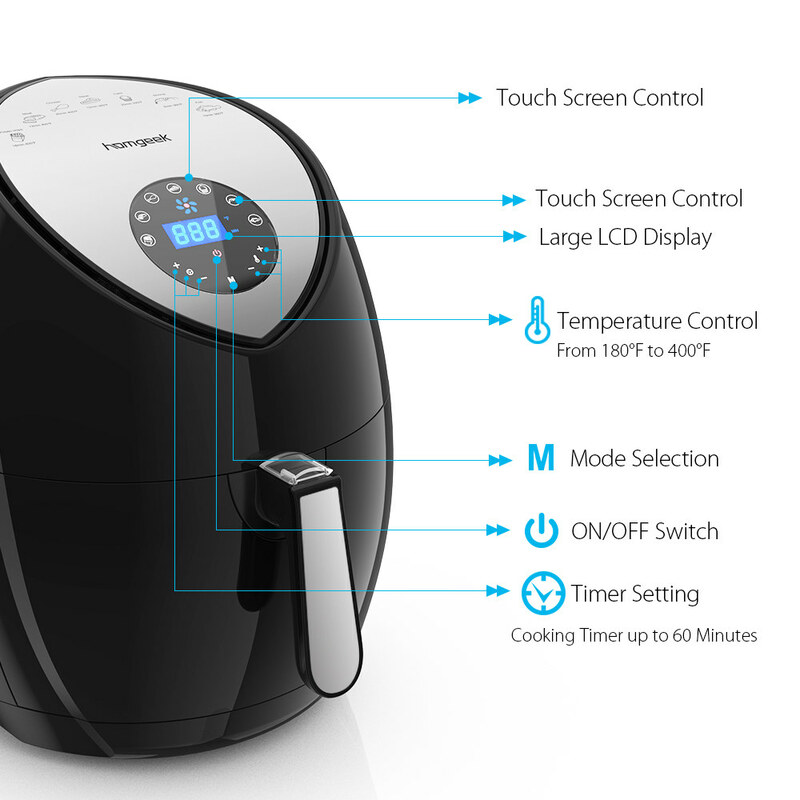 Thicken Air Fryer Housing: has good thermal insulation properties and high anti-scalding effect. Comes with a Cookbook and a User Manual: a cookbook with 8 recipes for your reference. 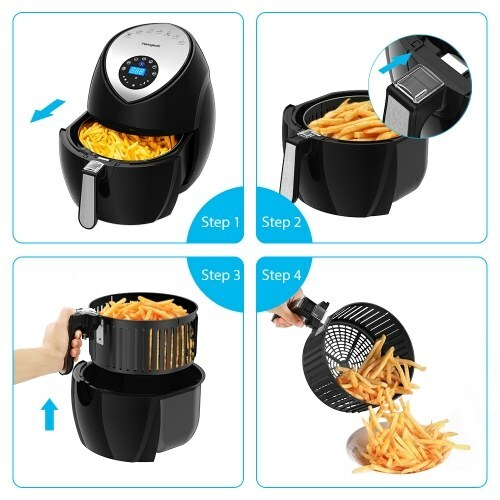 Healthy Diet: a healthy way for fry without/with little oil, low fat, low calories, help you to keep fit and keep your children away from unhealthy food. 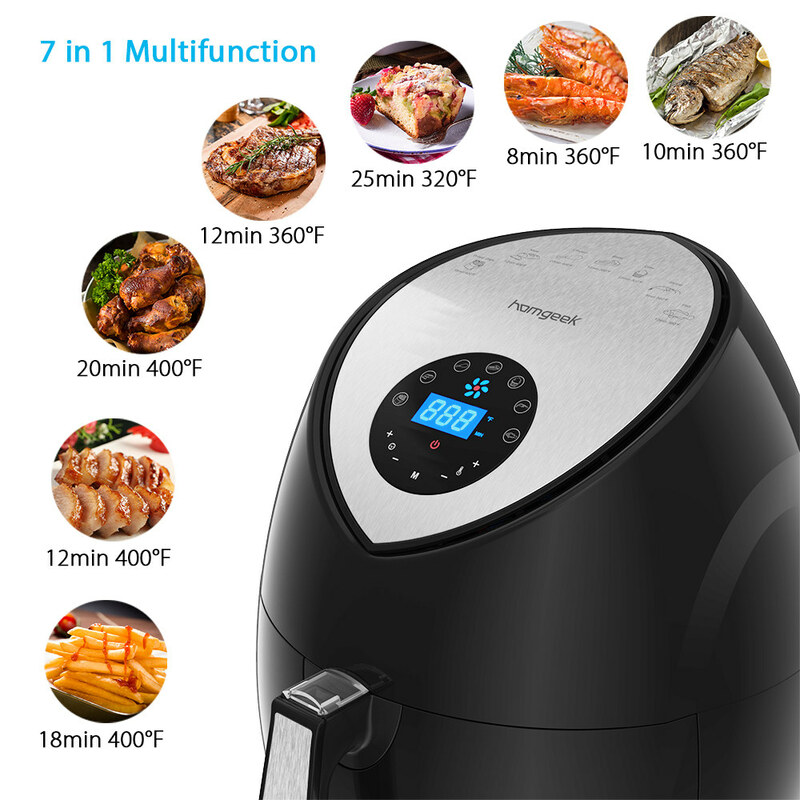 Stainless Steel Top Panel: cooking temperature and time of 7 common ingredients are printed on the top cover of the air fryer for your reference.